Do you have old car batteries lying around in your garage? Don’t throw them away just yet. You can make a good amount of money from them. If you want to know how, read along because we will show you some easy steps on how you can do car battery recycling for cash. The answer is that not just one but you have three options where you can make money off of disposing batteries. The first place is the local auto parts stores. This is the first logical option to sell those batteries. We all have these stores located in our vicinity. Take a walk around the neighborhood, or ask nearby residents and they would know of such a store. Many of these shops have been in the business and will accept your batteries with no questions asked. You could negotiate and get anything between $6 to $8. Some stores might not be ready to hand out cash, but they will most definitely be happy giving you store credit which means that the next time you buy something from there shop, you will get a good discount. If you have old batteries in bulk, then you can get a better deal. So if you wish, then you could collect a few old batteries then sell them and get a better price for each battery. The second place where you can easily send off these batteries is the scrap yards. But I suggest you find a foundry near you. A foundry is the name of any place which works in the production of metal castings. These foundries melt the object, and later cool the liquid and give it a new shape. Most often these foundries deal with aluminum or cast iron but sometimes also with bronze, steel, zinc, and brass. Every city has a foundry or more, and they will give you a good rate for your old and used up batteries. And here’s your third option which is the good local people. There will be people who are interested in buying your batteries, but they will not give you as good a rate for it as most local stores and foundries and scrap yards. Plus, you will have to invest more time finding these people. These people would want a cut for themselves is the thing though. You must also know that there are certain organizations such as United battery which is in the business of full-service batteries and auto electric repairs and they have a famous ongoing scheme wherein they will give you cash for junk. They offer pretty good rates for lead-acid batteries. Many more battery sellers and repair shops may have attractive deals you could benefit from. You could use yellow pages, dial a few quick numbers and your search will surely lead to you finding places offering cash for junk. There will be one or two in your area, and that’s how the job is done quickly and simply. If your question has not been answered yet and you still have a lingering doubt such as who buys used automotive batteries then the answer is metal recyclers, auto parts stores, and auto repair shops. What do these people do with these batteries? They refurbish these batteries and then sell them again and this way they earn from your old battery after doing some work on it and save some money for themselves even after paying you a good price of around $10. These people in the refurbishing business will be happier buying from you if you give them a bulk of old batteries. These could be truck batteries or batteries from any other vehicle. Collect old batteries from all your vehicles, and send them to the refurbishing agency and earn a good sum. If you have about two dozen old batteries in your garage, then that means you have battery stuff worth $300. But you have to bargain though because initially, these refurbishing agencies will tell you that even a single dollar is a good sum as after all you are not going to do anything with your old battery which is true but the fair price for it would still be around at least $4- $5. 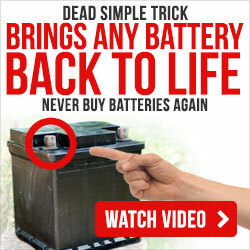 Now we have established one thing that even dead, old, used up batteries can earn us money. But now, the question is how do you sell them? Why is this supposed junk still worth something in the market? The reason is that many countries around the world are looking for this junk in magnitude because they want to recycle them and sell them in turn as new products. When there are so many buyers for it then why would someone not sell used vehicle batteries for cash, right? You may sell old batteries in good condition but what to do with damaged batteries? Damaged batteries will not sell, and you are better off disposing of them. The question now is “how do you recycle automotive batteries?”. First, be sure that it is time to replace the battery. Replace the battery if it is leaking, or bulging and fattening, is depleted, and does not charge, or when cell covers have gone missing. It is common knowledge that used vehicle batteries are not counted as normal domestic waste and garbage and should certainly not be dumped along with domestic garbage. These batteries from cars should be sent to recycling centers dedicated to these items. It is not considered safe for the environment otherwise. Also, you may get fines and penalties by just dumping your battery in the trash. This is because the battery contains lead and sulphuric acid both of which are harmful to the environment in multiple ways. When you are removing the old battery from the vehicle, then you must use gloves and glasses as harmful acid may be leaking out. Ensure whether the battery is damaged or not. If it is not damaged, then wrap the battery in plastic. Or if it is leaking then uses trash bags and double wrap it. Hold the plastic in an upright position so that you do not have to wrap it too tight. Ensure that the battery stays upright the whole time. Reach the battery recycling center. Look for a center online in case you do not know of one. Some recycling centers have pick up and drop off facilities, too. You may be asked for a small fee to recycle. A battery which is leaking ought to be wrapped in heavy plastic. These batteries are re-built and used again, and the lead which the battery contains is recycled. This recycling removes the lead content from coming in contact with the environment. Let us look at the recycling process in detail. First, the plastic is beaten, and its parts such as plastic, lead, and electrolytes are flattened out. The entire plastic is crushed and converted into new battery cases. It is important to follow this process, or the plastic would stay as it is for hundreds of years thus constantly harming the environment. The lead in the battery is melted. This is used to produce lead oxide and new grids for the battery. The sulfuric acid is neutralized in two ways. The first method is to transform it into the water which is treated and clarified and then allowed to be let out in sewers. The second method is more recently discovered. Here, the sulfuric acid is transformed into sodium sulfate. This sodium sulfate is used to produce washing powders, glass, and used in the manufacturing of textiles. You may also want to send your used battery over to the retailer who will either rebuild the battery or send it for disposal. It is pertinent to note here that when you buy a battery, you pay a core charge on it which means you get a discount when you return it. This practice is highly encouraged. For old cores, you get up to $10-$80. It is also not compulsory to buy a new item after handing over your old battery. Recycling of car batteries is such a big business now that entrepreneurs are also looking at this as a major opportunity. (This info will help you to get an idea if you want to get started your business from here). Recycling laws are stringent, and there are grave penalties for those of who are found in violation of such laws. These laws ensure that these batteries do not cause air, water, and soil pollution. Lead is contained in large quantities in the batteries which can cause lead poisoning in not only humans but also animals. Few of the recycling plants allow only Lead acid batteries and do not deal with Ni-Cad batteries and hence make sure that the recycling plant you are going to deals with the kind of batteries that you have. Lead batteries have a symbol Pb on them which can help you identify the type of battery you possess. An interesting statistic which you should know is that vehicle batteries are the most recycled elements in the world. Nearly 9/10 of all lead-acid batteries of the world are recycled. Plus, there is so much lead from these batteries coming in on a daily basis that the lead recycling process goes on indefinitely and the lead and plastic which has once been used would continue undergoing the recycling process for so many times. It is a fact that the recycling of batteries is a very environment-friendly and cost-effective method. You have so many options for car battery recycling for cash. So don’t just throw them away. Hopefully, the information you got from this article will encourage you to take steps to dispose of the batteries properly. You will not only benefit from it financially, but you will also help conserve the environment. If you want to know how to sell other types of old batteries, why don’t you drop us an email and we’ll answer your questions. We’ll be sure to send over some really good information that you can use to make good cash for your old batteries.